DeMarcus Cousins, Kevin Durant, James Harden, and Damian Lillard sit right behind the top five, as all are rated 92 overall. Anthony Davis and Andre Drummond are both rated 91 overall, while John Wall and Draymond Green are 90 overall, for a total of thirteen players rated 90+ overall in the latest update. Recent player movement and subsequent jersey number changes are also accounted for, as well as gear and accessory updates for 44 players. For a full breakdown of the changes in the latest NBA Live 16 roster, be sure to check out this spreadsheet. 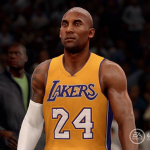 As always, feel free to post any thoughts on the latest roster update in the comments section below, as well as this thread in the NBA Live 16 section of the NLSC Forum.